SELLER FOUND NEW HOME/MOTIVATED. Beautifully renovated 15 acre historic equestrian estate. Over 2,200 sq ft of open living space boasting formal dining room, powder room off huge main floor mudroom/lndry room, new kitchen w/ ss appliances & marble counters, family room w/ double French doors, a bay window overlooking fire pit & 100 year old black walnut family of trees. 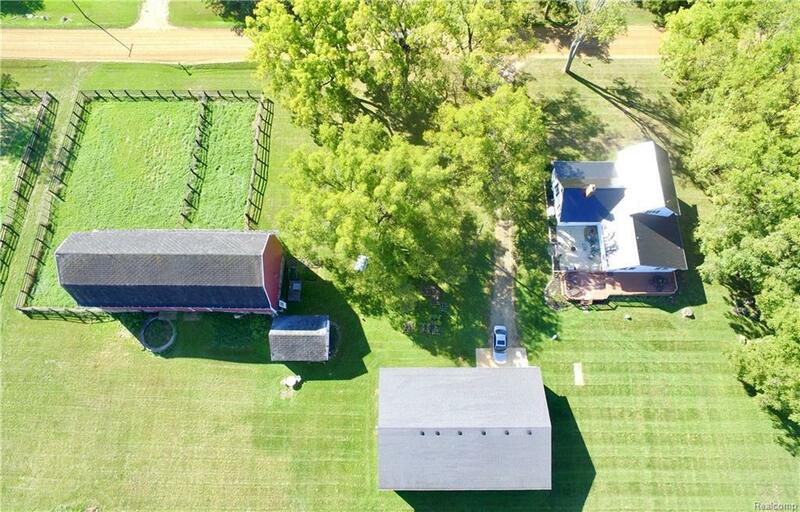 Metal roof, expansive covered front porch w/ views of NO NEIGHBORS, (corner lot) first fl mstr ste, 40 x 60 heated barn/pole barn w/ 4 matted stalls, 3 frost free hydrants on property, electric at pastures, 1910 hip-roof barn w/ (in great shape) new goat fencing attached, amazing hay loft, huge 120' round pen for working & riding horses, 3 sided shelter in pasture, large hay pasture/yields 700-900 quality bales/season. Hard wired smoke detectors in all 3 barns/wired to the home for safe alert, new AC 2106, new furnace 2018, new radon detector 2017, new Generac full home generator 2016, new well 2018...SCHOOL OF CHOICE!